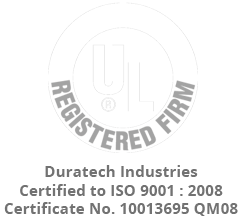 DuraTech Industries is a contract manufacturer of screen printed graphics and identification products for the medical, computer and transportation markets serving numerous fortune 1000 companies. We are in the graphic screen printing business, manufacturing screen print graphics for these and many other markets. We will educate and train our employees in helping us maintain a safe work environment. rethinking, reducing, reusing, repairing or recycling. We will show strong commitment to segregation of waste through a recycling and re-use program. We will ensure compliance with all government regulations. We will reduce the use of solvent and VOC emissions, by switching to less hazardous UV products and constructions. We will regularly monitor and report on our environmental performance. We will continue to work with our energy supplier on reduction of energy usage through education and training and utilize ‘green’ resources whenever possible. We will work with our suppliers on ‘green’ sustainable alternatives and reduce transportation costs by buying local whenever possible.